While preparing for my daughter’s bat mitzvah in May, in a moment of madness I auditioned for a play, got a part and was onstage most weekends in April. Classmate Rob Levy and his lovely family came to my home for dinner a couple of months ago. It was great catching up. I’ve also attended a couple of recent Brandeis events in Washington, D.C. Where were my classmates? Since becoming executive director of the Schwartz Center for Compassionate Healthcare in 2004, Julie Rosen has grown the organization from a small local outfit with a budget of $750,000 to a national leader in educating clinicians about better bedside manners with a budget of $3 million. Its signature program, Schwartz Center Rounds, is used in 210 hospitals and by 70,000 clinicians per year. The Schwartz Center was launched in memory of Ken Schwartz, a 40-year-old Boston lawyer who was diagnosed with lung cancer in 1994. Ken’s wish was for other patients to receive the same compassionate care that he received from doctors, nurses and other caregivers. Peter Goldman, a chiropractor who works with several high-profile athletes in the San Francisco Bay area, was featured in a recent story in the San Francisco Chronicle. His patients include Oakland Raiders quarterback Bruce Gradkowski and mixed martial arts fighters B.J. Penn and Jake Shields. A black belt in Oyama full-contact karate and a brown belt in Brazilian Jiu-Jitsu, Peter was a full-contact karate fighter in the early 1990s. Meredith Apfelbaum (third from left), assistant director for alumni career services at the Hiatt Career Center, traveled to Baltimore to lead a session, “LinkedIn, B Connect, and Beyond: Maximizing Your Networking Potential,” for alumni. 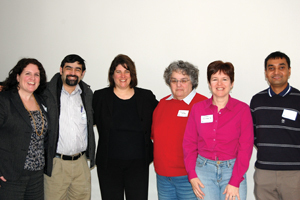 Pictured (left to right): Monica Harris Susel ’89, president of the Alumni Club of Baltimore; Arnon Shorr ’05; Apfelbaum; Elaine (White) Laube ’70; Loren Reisner Weisman ’83; and Mohammad Zulfiquer Hossain ’03.